The snowy scene at Westbourne Terrace, Lisburn on Wednesday afternoon. With snow and ice causing treacherous conditions on many local roads, Lisburn Police are advising motorists to stay on main arterial routes if possible. Other roads affected include Pond Park Road, Antrim Road and many routes in rural areas. “Please stay to main arterial routes wherever possible,” the police added. On Wednesday afternoon, drivers were also being advised to avoid the Kilcorig Road due to a road traffic collision. Meanwhile, Trafficwatch NI has warned motorists travelling on the M1 of “hazardous driving conditions between J3 Blacks Road and J9 Moira”. Translink has also reported disruption to a number of bus and train services. 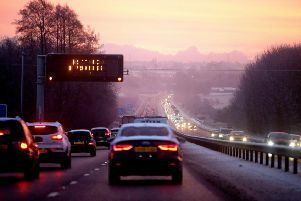 The Met Office says a ‘yellow warning’ for snow and ice remains in place until Saturday, March 3.